What’s your dream job and how do you achieve this goal? Flux Factory artist in residence Aliya Bonar wants to know, and during a weeklong after-school camp she plans to find out. 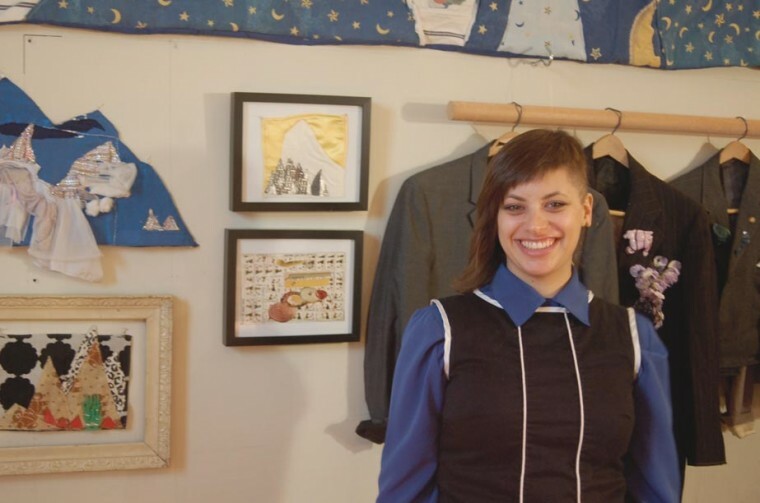 From Feb. 4 to 10 the seamstress-extraordinaire will serve as den mom to a group of girl scouts, a team of artists and one Queens resident to go through dream-job boot camp. After the week of camp, Bonar will turn the Flux Factory gallery into a clubhouse of sorts, which the community can explore on Saturday Feb. 9. The camp will be recorded in many ways to be viewed in the gallery. The following day Bonar will lead a discussion about the quest for a dream job. “I’m very interested in how to make people feel comfortable,” said Bonar, who holds a degree in socially engaged art from Hampshire College. “People aren’t always safe and comfortable and it’s hard to talk about that. Inside a tent with cookies maybe they will. “It’s about making space to interact in a new way,” she said. Bonar, who by day teaches children how to sew, has created many mountainous landscapes stitched together out of pastel comforters like a scene from the movie “The Science of Sleep.” Dotting the mountains are little fabric trees and silk flowers she has collected over the years. Also inside her Flux Factory studio is a tent made out of the same worn bedding that she forges mystical hills out of. When the viewer crawls inside, those same hills line the interior and little stars dangle from the fabric ceiling. For two months she created a new flag with a word of the day embroidered in the middle. The banners dangle from her studio’s wall. Bonar brought the project to a group of children at the Families in Need General Preventative Program facility at the Southern Queens Park Association, who now have their own string of motivational flags. However, creating a physical space where Bonar and others are comfortable is more than the walls. Lately the artist has experimented with her own idea of a powersuit. “It may be a sweat suit or a rain jacket,” Bonar said. For her it’s a series of blazers adorned with trinkets she has collected — a series of toothbrushes, keys that remind her of a time she locked herself out of her apartment, little plastic figurines and silk flowers. “These memories empower me,” she said. When: Reception Saturday, Feb. 9, from 6 to 9 p.m., public discussion Sunday, Feb. 10, from 2 to 5 p.m.